This is the best trip in my life till date.Actually we planned a trip to Goa while we were in engineering,but after postponing it for several times finally we planned perfectly and went there after 2 yrs from the completion of engineering. First let me introduce my friends who accompanied me, Vishnu, Chandu, Raj, Apparao, Raju, suresh and avinash. Initially we thought of going only to Goa for a 3 days trip. 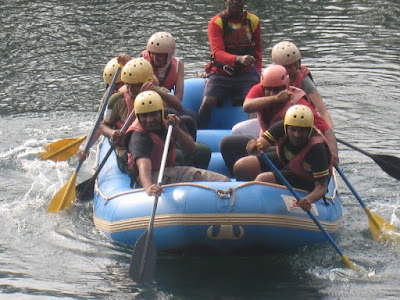 While finalising all the itinerary for the tour,we found the place dandeli which is in karnataka famous for river rafting in kali river so we included that too. we scheduled the three days trip to Goa from Hyderabad. As the hotel rates were high in between DEC 20 and Jan 10, we started on Jan 13 2010 night from Hyderabad by train(Train No:7603 kachiguda to vasco, Goa) which started at 9.00 pm. As there are only two bogis in this train goes to Goa,we didn't get the 3AC coach. This train will reach vasco around 2.00 pm next day. But we get down at londa station which is the nest station from hubli dharwad. From hubli train travels between the beautiful western ghats and forests. We reached londa around 10.00 am,and thought we will get some accommodation there so that we can fresh up and go for rafting which is at dandeli approx 20km from londa. To our surprise,we didn't find any hotels there not even some good food. so my sincere advise, if you are interested rafting @ dandeli please book jungle resorts there, they are really too gud. 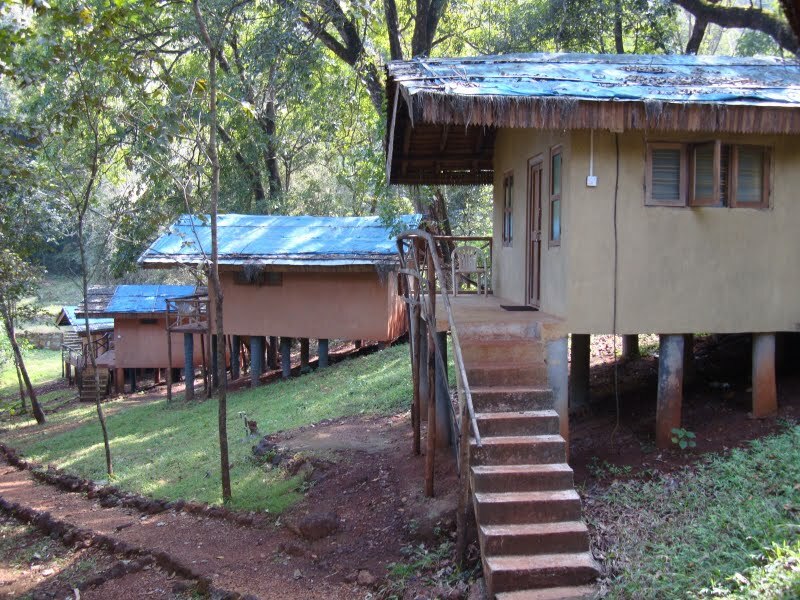 We called rafting organiser(anil) and asked for the accommodation @ dandeli. He was soo friendly and gave a large tree house in middle of the forest and they didn't charged anything for tree house. 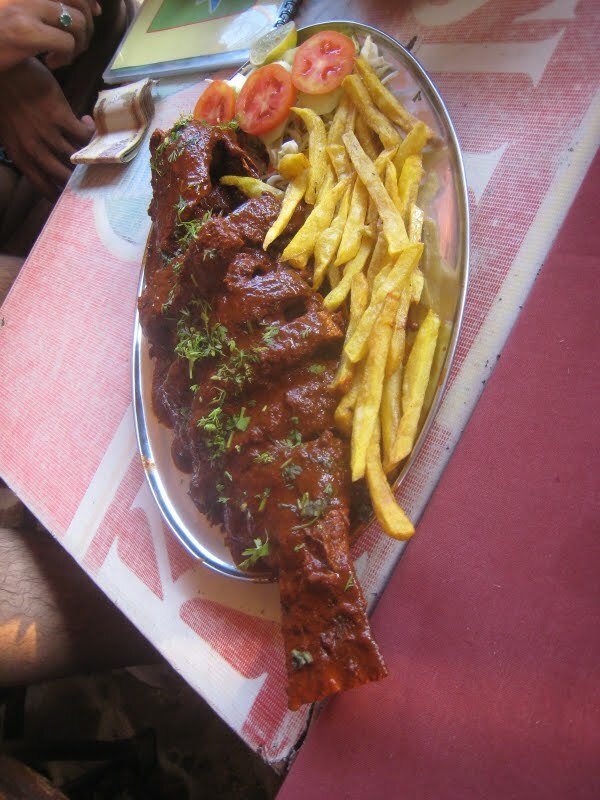 For more information on dandeli and activities there please visit http://www.dandelimasti.com/contactus.html. we stayed at "Old Magazine House " and truly it is the best place to relax.The Old Magazine House is situated in a very thick evergreen forest and offers a real jungle experience. Just 10 minutes away from the rafting start point this is the most convenient place to stay for rafting guests.We booked a cab at londa, so that we can travel to dandeli and then to calangute(Goa) in that cab. As we have to travel most of the distance in forests,they will charge around 3k. ﻿After having some delicious breakfast in the resort,we started for rafting in our car. we have to travel around 10km in the cab so that we can reach the starting point for the rafting. They gave us life jackets and told precautions while doing rafting. Even a non swimmer can easily do rafting,but needed energy to row the boat. we divided into two groups, so that we can have a boat race while rafting. Me and chandu lead one raft,while vishnu and avinash lead the other raft. People sitting in the first row of the raft has to row more and they can the enjoy the max. After rowing for few minutes,the instructor asked every one in the raft to jump into the river. I'm really scared when he asked that, but some how i jumped into the river and stayed for a few minutes. Then started the rafting adventures. we have to row for 3 hrs in the middle of the forest and there will be 7 rapids,and we fully enjoyed while passing through every rapid. After 3 hrs of rafting we reached our destination and did some trekking in beautiful forest before reaching our vehicle. I never forget this trekking experience and will definitely plan the same in near future.After refreshing for some time,we started for calangute. We started around 6pm at dandeli and reached calangute at around 10pm. Vishnu,with the help of his friend booked a hotel near to calangute beach. Truly it is a nice budget hotel and located at the center of calangute. We had a nice party on that night and ended the first day of our trip in a grt way. The second day we planned for some adventures at calangute beach and went to beach around 12pm. On the way to beach we bought goggles as the place is very hot even in winter. We booked 4 adventures rides as a package for 700 each which includes paragliding, banana ride, scooter ride and bump ride.Scooter ride and bump ride is of less risk when compared to the other two. 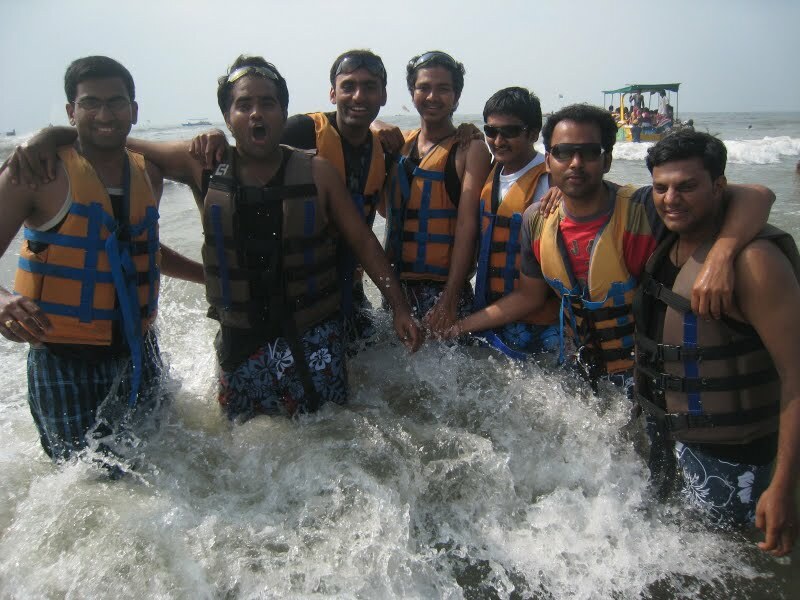 calangute is the best place for doing these kind of adventures. For paragliding, they will take in a normal boat to a place which is abt 2km from the beach where they a special boat which will have all the equipment required for paragliding. 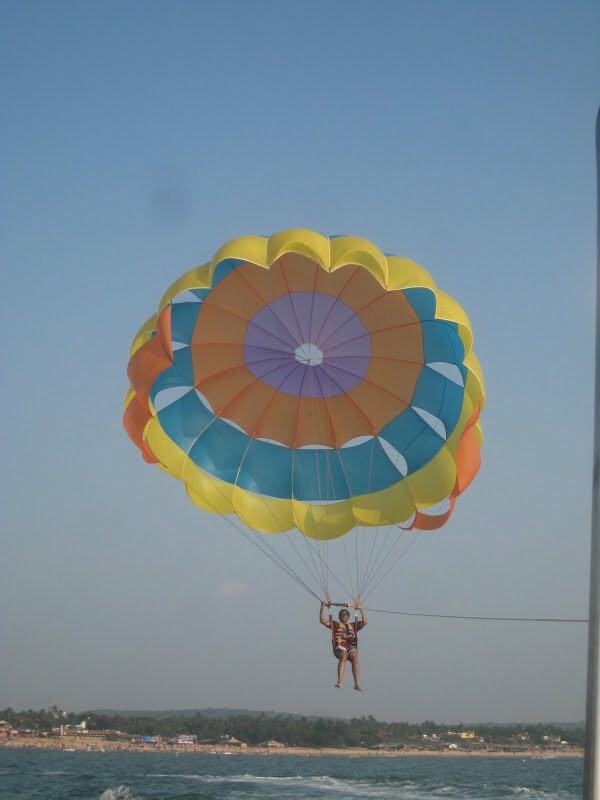 We can get the full view of the calangute beach while gliding. After doing some adventures,we had a yummy lunch at the calangute beach side restaurant. Dont forget to have very special sea food there. Night we planned to go the famous pub in north Goa 'TITO' @ baga beach. we were surprised on seeing the night lyf at Goa.Truly its amazing life. Life start only after evening at goa. There are many famous pubs in the baga beach road, if u want to enjoy Goa lyf fully ,plan for a night there. Many pubs will offer different kinds of entertainment and will be economical too, but never go to such places,go only to the renowned pubs. Experiences at that night was amazing and no one from our group will forget that in life. 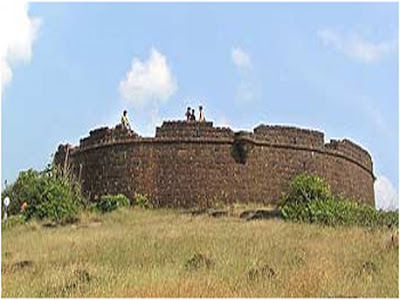 Next day we planned for visiting chapora fort and vagator beach. We did some trekking for going to the chapora fort and view from the chapora fort is excellent. vagator is the beach next to fort. There will be less crowd in that beach compared to other beaches. We spent that day very leisurely and spent the entire evening at the vagator beach. As it was Saturday, there was a shopping festival held at anjuna. We didn't find any thing useful there,only shells and some ladies wear. It is mainly intended for foreigners , so don't expect much for shopping in Goa. The shopping start only after 8 and it will be open till 3 am. As it was the last night in Goa , we explored all the beaches late night and enjoyed all the night at baga beach. Next day we planned for half day tour to panjim. But as we have bus at 4 pm, we didn't explored much at panjim. Me and raj had a nice interaction with police on the way to panjim he he and some how we managed to escape from him. After returning from panjim,we packed all our stuff and again started to panjim for boarding the bus. By this most memorable Goa trip ended. Rafting:1200 ph. After Rafting, Dandeli to calangute by Sumo. Enjoyed the Night lyf @ Goa. 5th Day:- Visited Panjim and 4 P.M boarded bus to Hyd at panjim.